Middle East cable market size was USD 6.33 billion in 2015, and is projected to exceed USD 11.5 billion by 2023, growing at 8.4% CAGR. Increasing number of energy projects across the Middle East is anticipated to drive the industry over the timeframe. Escalating industrial and construction activities is likely to catalyze cable market demand from 2016 to 2023. Considerable infrastructure activity expectations and extensive national development plans by Gulf Cooperation Council (GCC) government to expand the economies gradually is anticipated to reduce their reliance on oil and gas reserves, and also be recognized on the world stage. Large number of construction and infrastructure programs will need to be undertaken in order to deliver these targets. More than 200 major projects are planned for completion by 2023, costing around USD 1 trillion. These projects mainly involves a combination of real estate, health, retail, leisure, and education asset developments along with communication, transport, as well as supporting social infrastructure systems. Smart city development around the region such as Lusail City (Qatar), Mohammad Bin Rashid City (UAE), Basra New City (Iraq) and King Abdullah Economic City (KSA) and the infrastructure upgrading is expected to be the vital factors for Middle East cable market growth. Favorable regulatory norms and abundant availability of cheap labor is forecast to fuel the industry over the forecast timeframe. Rapidly growing tourism and transportation in countries such as Qatar as well as Dubai will fuel growth through 2023. Increasing electricity consumption in the residential and commercial sector is projected to drive revenue. In addition, rising focus on energy generation owing to increasing need to address the electricity requirement is expected to catalyze demand over the next seven years. Energy and power generation projects are likely to account for significant share of the total regional spending. Power projects in Saudi Arabia, such as 2000 MW Shagaya Solar Farm in Kuwait and other conventional power plants along with the required power grids and transmission lines are projected to fuel Middle East cable market size. Furthermore, surging replacement of aging transmission lines to avoid accidents is expected to have a positive impact on the industry. This product requires combination of numerous raw materials such as copper, rubber, aluminum and thermoplastic. High price instability associated with raw materials along with ever-increasing energy cost is expected to negatively impact Middle East cable market price trend. For instance, dynamic aluminum as well as copper prices is likely to have substantial negative impacts on wiring and electricity cables industry. Middle East low voltage cable market size was valued at USD 1.84 billion in 2015, and is estimated to be worth around USD 3 billion by 2023. These are majorly used for low power transmission applications in buildings, for internal wiring purposes and electric rooms. Surging automation due to mounting purchase power is forecast to propel growth from 2016 to 2023. Medium voltage cable market share was the largest in 2015 and is likely to continue its dominance from 2016 to 2023. It is predicted to grow at over 8% CAGR. These are principally insulated with oil and paper and are then run into rigid steel pipe. Formation of voids allows partial discharges within the cable insulation and this is avoided by keeping oil under pressure. Increased adoption across the railway industry is also expected to drive revenue. Commercial sector was valued at USD 3.81 billion in 2015 and is expected to contribute to majority of the overall revenue in the coming years. Swift infrastructure development and increased purchasing power are likely to propel growth. Industrial application is expected to be an attractive segment with 8.5% CAGR estimations from 2016 to 2023. 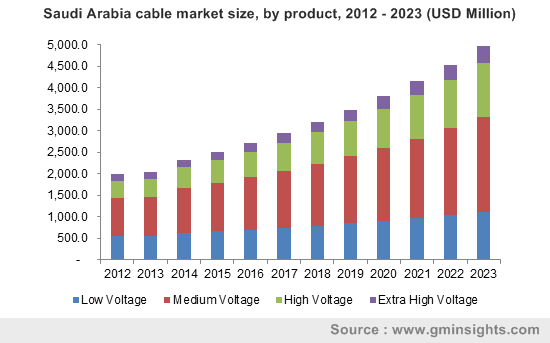 Saudi Arabia cable market was the largest regional segment and is expected to exhibit high growth prospects at 9% CAGR from 2016 to 2023. Booming infrastructure and construction projects across the region is predicated to augment growth over the next seven years. UAE industry growth can be dedicated to surging industrial application across the region. The industry is characterized by surge in demand for technologically advanced automated systems. Major participants for the Middle East cable market share include El-Sewedy, Riyadh Cables, Ducab, Oman Cables and Saudi Cables. Other prominent industry players are Belden, Encore Wire, Finolex, Fujikura, Furukawa Electric, General Cable, International Wire Group, KEI, LS Cable & System, Nexans, Prysmian, Southwire company, Sumitomo Electric Industries and The Okonite Company. In order to rise above the competitive pressure, suppliers focus on increased R&D investment and vertical integration. Competitive pricing and maintaining profit margins remain key strategies. Increasing demand for power transmission is driving incumbent participants to climb up the value chain and focus on the HV and EHV range. This surge can be substantiated in terms of new capacity additions and openings in the Middle Eastern countries. Cables are an assembly of one or more conductors having their own insulations and individual covering, optional screens, protective covering and assembly protection. These products are e made more flexible by stranding wires. The smaller individual wires braided or twisted together to produce larger and more flexible ones when compared to solid products. Electrical cables are composed of two or more wires organized parallel, twisted, braided and bonded together to form an individual assembly. This enables in connecting two devices facilitating the transfer of electrical signals between them. These are extensively used in power and signal circuits for electronic devices. Additionally, they also enable long-distance communication. High voltage products are used for bulk transmission of direct current (DC) or alternating current (AC).